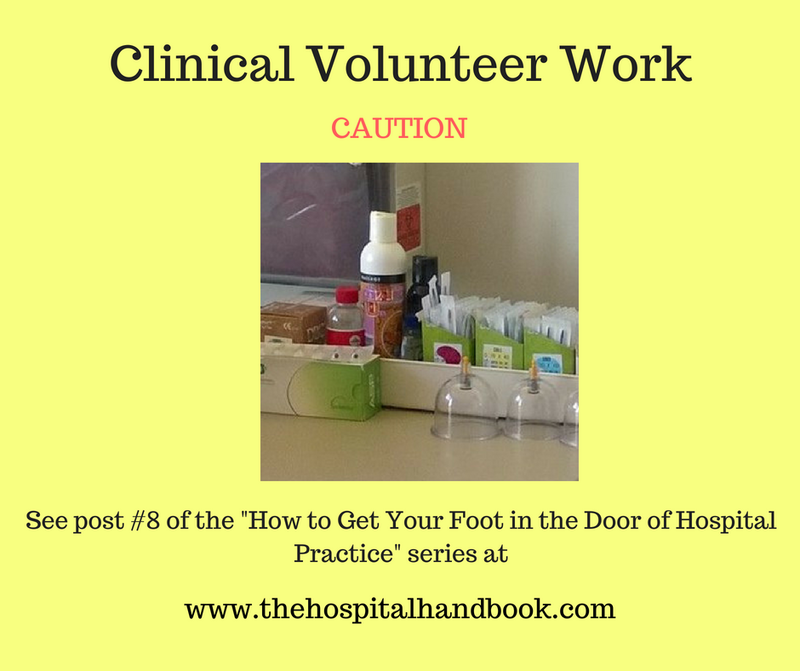 This is the last post in the series answering the question, "How do I get my foot in the door of hospital practice?" If you would like a copy of the download-able pdf of this series, pre-order it here. To continue to follow our resources as we build them, sign up on our email list. You can help build resources for the community like this by sponsoring a newsletter, a project, or as simple as buying me a cup of coffee. Regularly renew/enrich your clinical work by repeating steps 1-6. Lunchtime Listen recommendations--a growing list of resources to listen or watch while on your lunchbreak related to practicing in hospitals from research reviews with "review the biomed concepts" in the resource section to webinars by Duke University's Integrative Health Leadership Program. What is a Licensed Independent Practitioner and how does it applies to hospital-based practice? 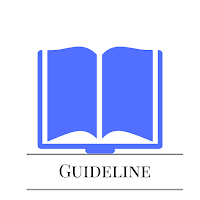 Gale, M, Hospital Practice: Recognition of Acupuncturist as a Licensed Independent Practitioner (LIP). Meridians: JAOM, 2016 3(4): 11-16, 41. Public access article available at the journal website. 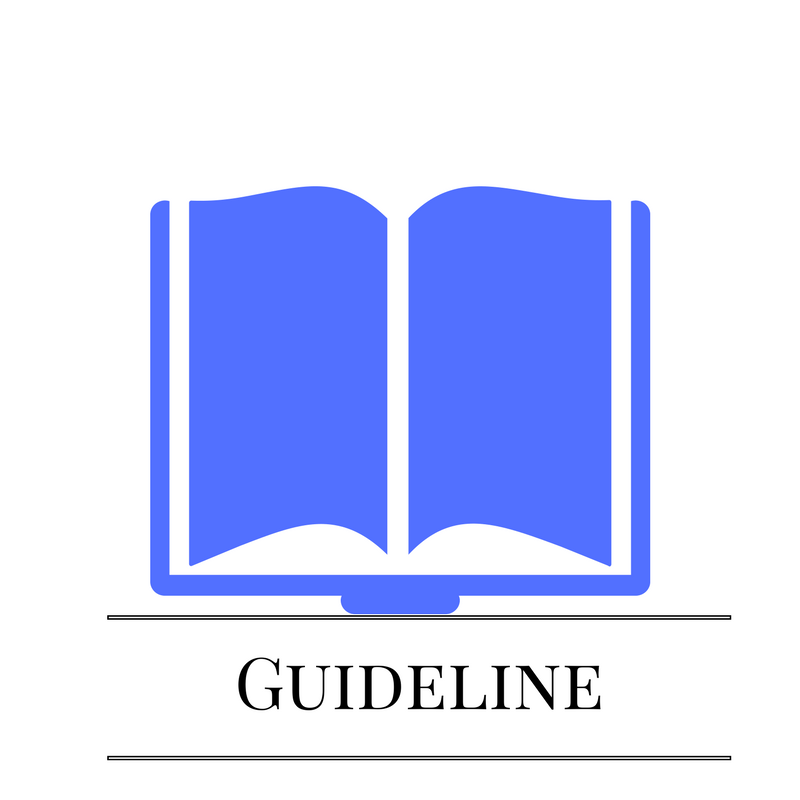 The Standard Occupational Code (SOC) for Acupuncturists is published, 2018. What is a Hospital Sponsor? Why you need one. Are you a New Hospital Employee? 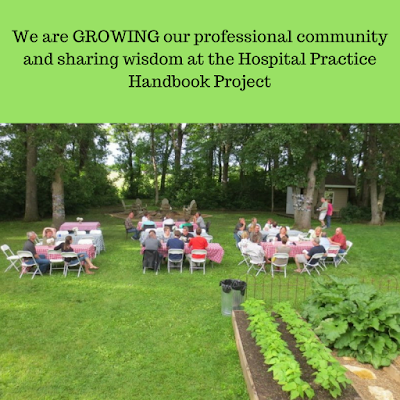 Stay connected to the Handbook via our blog, website, and email list and send your questions via the website contact page or the "message" feature on the public Facebook page. More posts relevant to questions we receive from the new hospital employee coming soon. You can support this work for as little as a coffee. Do you want to follow our work at the Hospital Handbook Project? Just sign up for the newsletter, subscribe to the blog, and like our Facebook page. 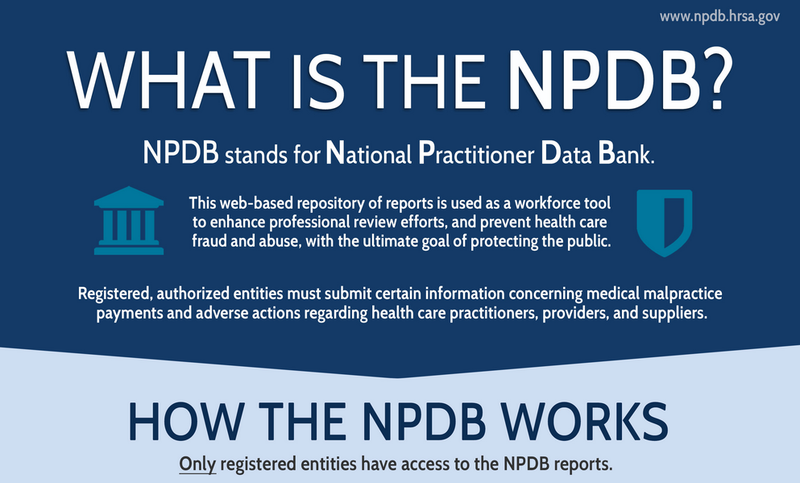 What is the National Databank for Healthcare Providers and How is it Relevant to Hospital-based Practice? This gets queried by the credentialing department when you have applied to a job and your paperwork is "processing". Along with a state criminal background check, the NPDB data bank is also checked. 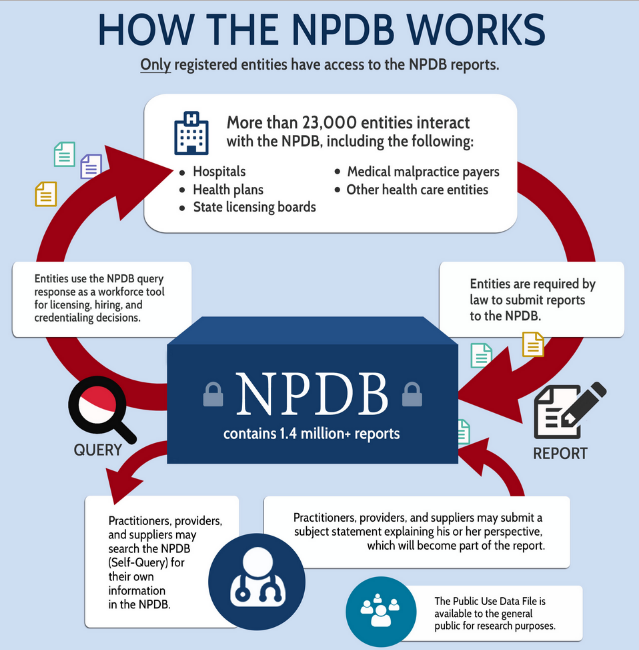 As a practitioner, you can do a self-query so you understand what data is being reported about you in this national data bank. 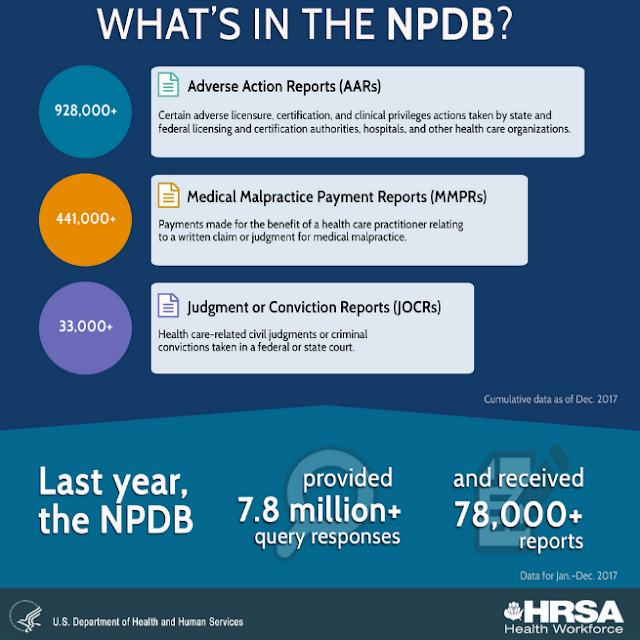 Learn more at the U.S. government website, run by the Department of Health and Human Services (HHS). 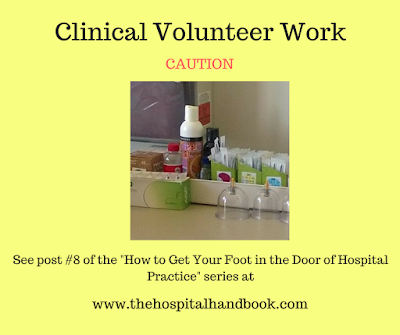 "Volunteering is a valuable way to learn about hospital culture, generally, and specifically for your clinic (volunteering location). 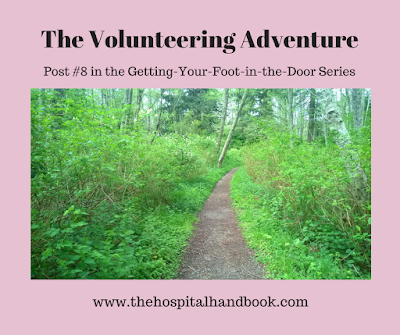 When volunteering, you provide value to your clinic and the larger organization." 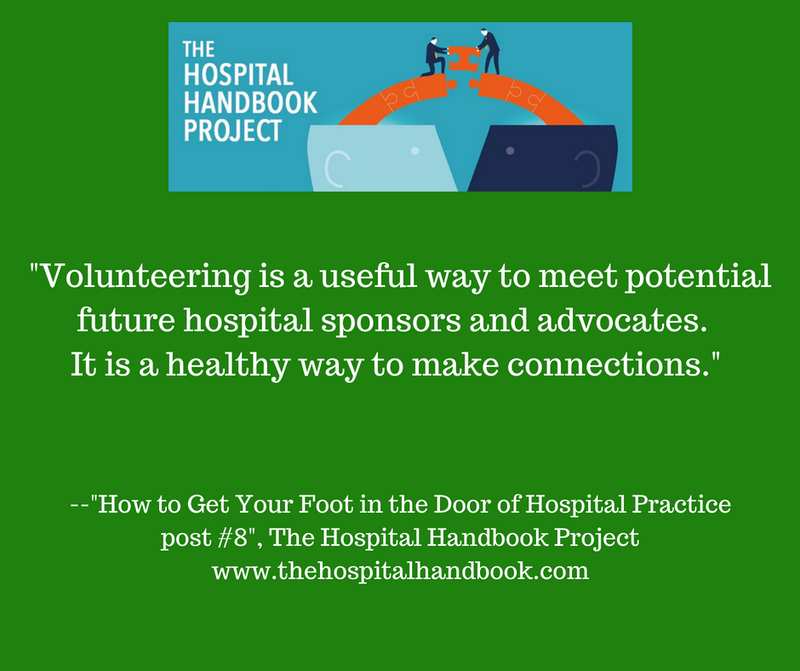 "Volunteering is a useful way to meet potential future hospital sponsors and advocates. It is a healthy way to make connections. You have heard the saying 'It’s not what you know, it’s who you know'. For L.Ac. s in hospital practice, it is both what you know and who you know. You need both." 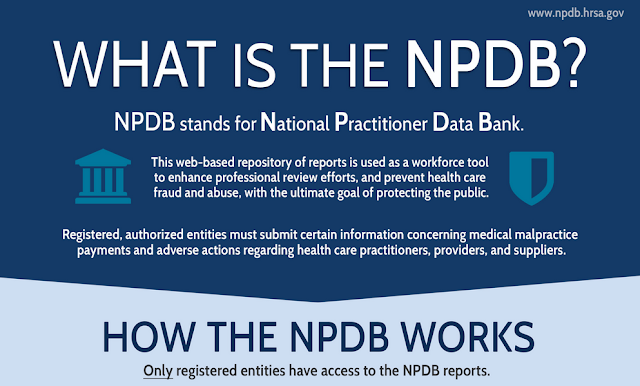 HIPAA = federal law on sharing of health information. "health information portability and accountability act"
PPD = skin test for exposure for TB; done annually for all health care workers, paid and unpaid, at a facility. intro--what do I mean by volunteering? 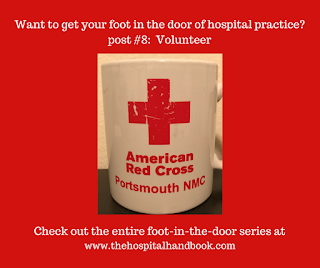 This is the 8th post in the series answering the question, "How do I get my foot in the door of hospital practice?" If you would like a copy of the download-able pdf of this series, pre-order it here. To continue to follow our resources as we build them, sign up on our email list. You can help build resources for the community like this by sponsoring a newsletter, a project, or as simple as buying me a cup of coffee. Volunteer work is usually more consistent than shadowing. Time spent in volunteering is balanced on what you can give in time vs. what the facility or program needs. This can be as intense as one 8-hour shift a week or as little as one 2-4 hour shift a month. Less consistent volunteering (less than once a month) at a facility is usually discouraged because the volunteer coordinator needs to track all her current volunteers and that is easier to do when she knows when and where you usually report so she can help you stay consistent on your paperwork. Note: For the purpose of this post, "work" is short for "volunteer work". You can be the hospitality volunteer who brings the coffee cart around to the inpatient rooms, which might be every Thursday at 1000 with your volunteer partner Joyce. You may do non-clinical work in your favorite specialty: mother-baby unit, pain management, behavioral health, physical medicine and rehabilitation, sleep clinic, cancer care, pediatrics, etc. Or, you can work in department or clinic related to your field, such as wellness or health-promotion. 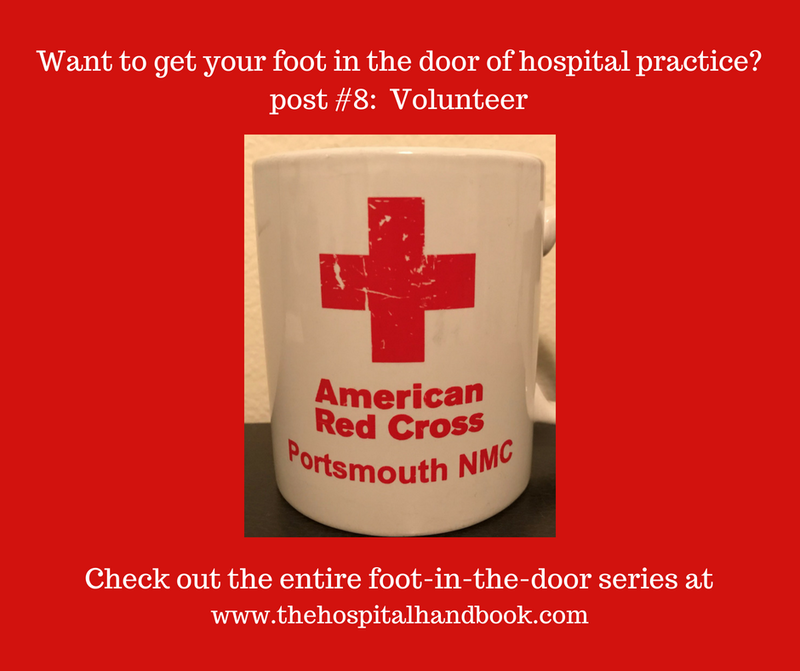 When I was a Red Cross volunteer at Portsmouth Naval Medical Center, I started out helping wherever they could use me. Nurse educators are awesome, by the way. 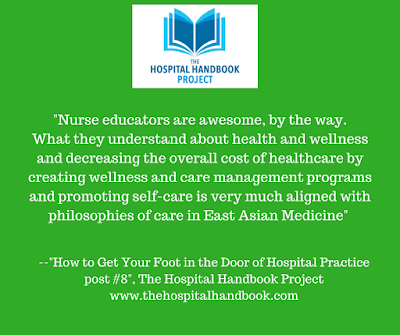 What they understand about health and wellness and decreasing the overall cost of healthcare by creating wellness and care management programs and promoting self-care is very much aligned with philosophies of care in East Asian Medicine. In the Wellness and Health Promotion department I started by sorting files and education materials and eventually was tasked to run a small walking program while the lead was deployed. When I worked in the walking program, we did a lunchtime lecture series for the program participants where we coordinated speakers from several departments to talk about a subject related to health around walking. Topics varied and included: proper shoe wear, nutrition, weight management/BMI check, and stress management and speakers came from backgrounds of nutrition/dietetics, physical medicine and rehabilitation, behavioral health, diabetes management, tobacco cessation, physical readiness (PRT), and wellness/health promotion. I volunteered one full day a week for about 3 years. I loved what I did and the people I volunteered for have been lifelong contacts and sources for great future job recommendations. And, this was work in my field of “wellness and health promotion” without doing clinical work. 2. Just enough is given and well-executed with a team of advocates for your work in the hospital and they begin the long process of creating a paid part-time or full-time clinical position. You apply and are hired. 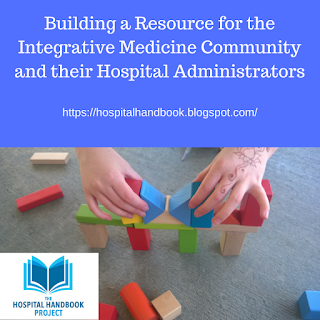 Be connected to the larger (national and international) hospital practice EAMP community to help you avoid re-inventing the wheel and learn from the mistakes of others. 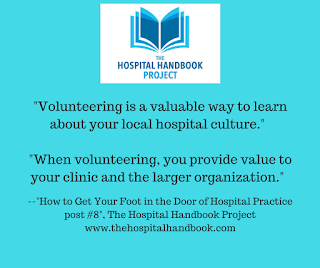 Volunteering is a valuable way to learn about hospital culture, generally, and specifically for your clinic (volunteering location). 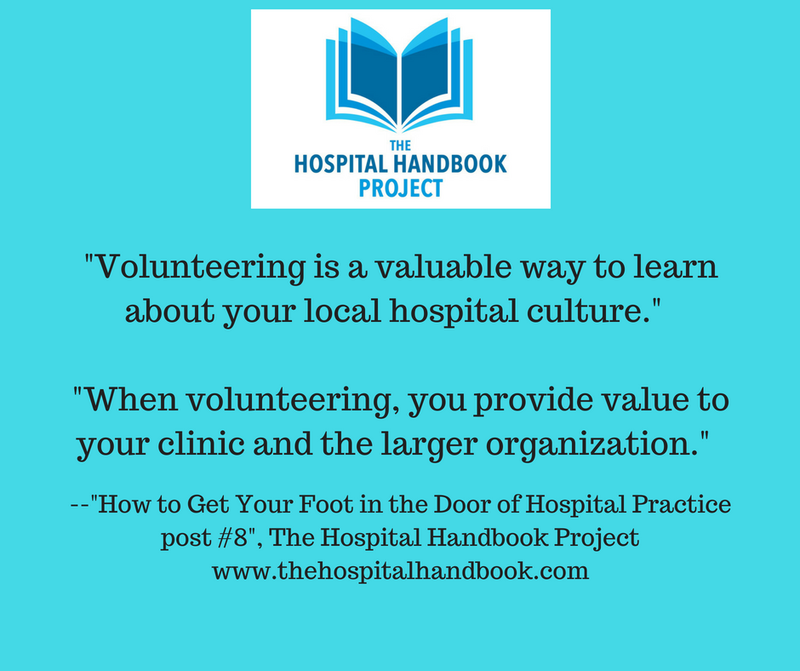 When volunteering, you provide value to your clinic and the larger organization. Volunteering is a useful way to meet potential future hospital sponsors and advocates. It is a healthy way to make connections. You have heard the saying “It’s not what you know, it’s who you know”. For L.Ac. s in hospital practice, it is both what you know and who you know. You need both. Balance volunteer work with your other responsibilities. Your volunteer work is valuable. If you consistently feel your volunteer work is not valued, and on self-reflection, you are sure you are not being over-sensitive, it is time to stop, go back to your organization’s volunteer coordinator and request a new assignment. 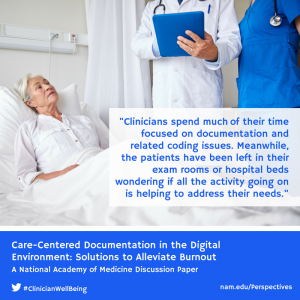 Try a different clinic or supervisor or department if what you are in is not working. Volunteering is about love (caritas, agape). If it feels terrible, stop and change it up. 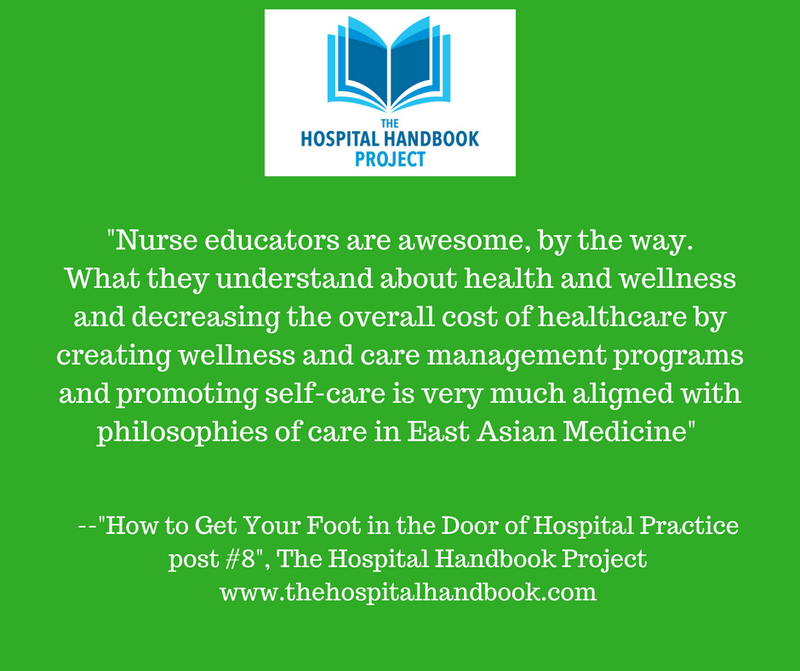 Thank you for following this special series, answering the most common question I receive, "How do I get my foot in the door of hospital practice?". You can catch up on the past posts here and pre-order the download-able pdf, which is a summary of all the posts in the series. There is only one post left, the Summary and Resources. ACIH = Academic Collaborative for Integrative Health, the "Collaborative"
The Collaborative (ACIH) has announced hospital-based massage practice standards this week. ACIH represents national integrative health and medicine organizations, universities, colleges and programs. ACIH's mission is to "enhance health by cultivating partnerships and advancing inter-professional education and collaborative practice". 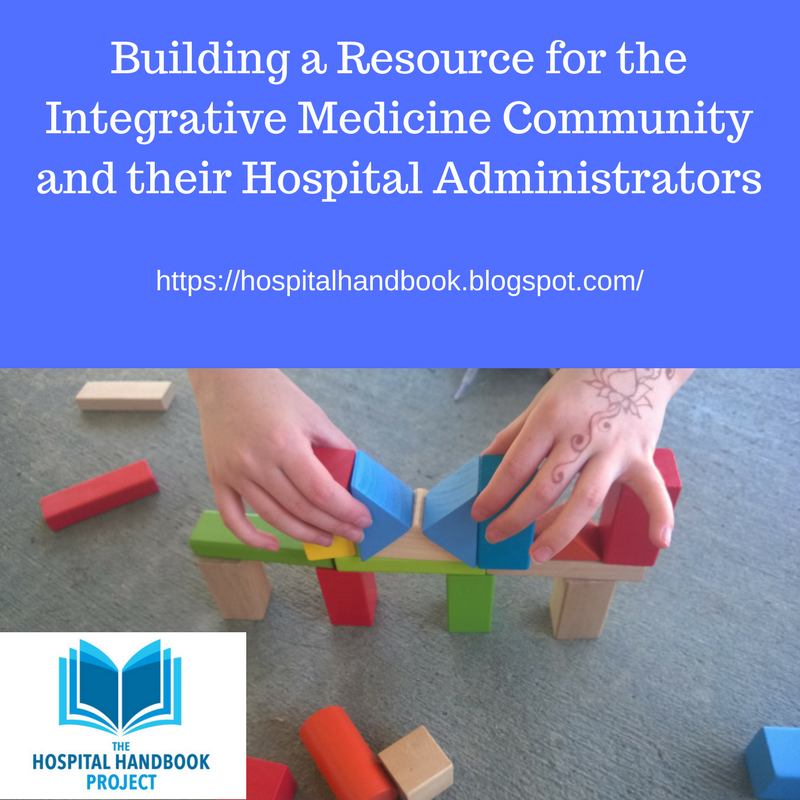 What is the Collaborative's definition of Hospital-based massage therapy competencies? "competencies define what a massage therapist should know and be able to do to practice safely and effectively in a hospital setting." "HBMT competencies was led by an ...ACIH task force [which was] formed because its members saw first-hand what could happen when hospitals aren't informed about how to practice in hospital settings." "HBMT specific competencies developed by the ACIH HBMT task force with input from approximately 40 individuals associated with HBMT programs. These competencies include some of the ACIH Competencies most relevant to HBMT and additional competencies that specifically address practical issues relevant to HBMT practice." Who benefits from these competencies? "The HBMT competencies are designed to be useful to hospitals, massage therapists, and MT educators." The facility: "HBMT specific competencies help with hiring, working with, and evaluating MT staff." The practitioner: these "competencies can serve as a tool to inform you of the skills needed to practice in the hospital environment and inform your scope of practice." The MT educator: "competencies serve as guidelines for curriculum development and can provide topics for CE courses about working in a hospital environment." The ACIH HBMT Task Force requests these competencies are shared broadly and that you let them know how you are using them or how you envision using them in the future. "We are tracking how and where the HBMT competencies are being used, and would greatly appreciate hearing about your experiences with them." Who are the ACIH HBMT Task Force Members? This is a YouTube video. The Moving Beyond Medications infographic, 2017. We have done several blogposts referencing this. Credentialing Licensed Acupuncturists in Healthcare Organizations, a Guide for Administrators, 2016. Now a bit outdated with the release of the BLS Code. Please see the new Standard Occupational Code publication (Jan 2018) and the VA Staffing Position (related code creation), Feb 2018. Learn more about ACIH at their website. Project ECHO®, I love the idea behind it, how it goes beyond the basic telehealth consult, and enjoyed my time participating in it. 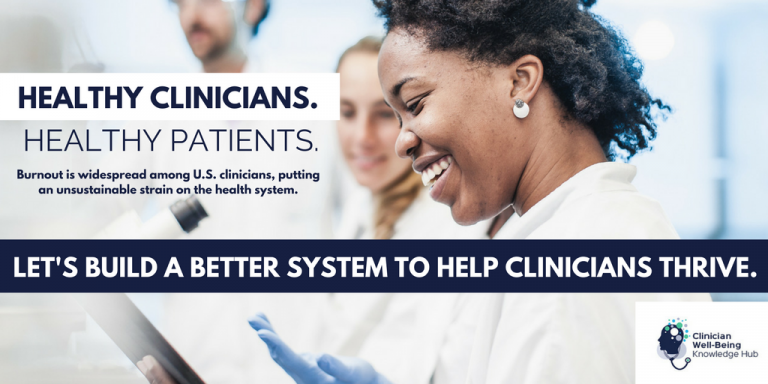 ECHO® = extended community healthcare option, created by the University of New Mexico. I mentioned Project ECHO® in the resource section of the May post on Shadow Physicians. 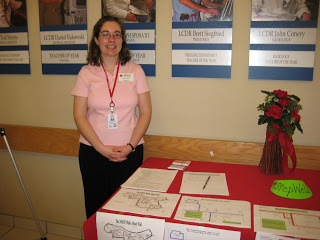 When I participated as part of a "hub", I felt the innovators of Project ECHO® truly believed in the value each discipline in the allied health provider fields brought to the table as important and essential, not auxillary, pieces to the whole-person health equation for the patient and the primary care provider. 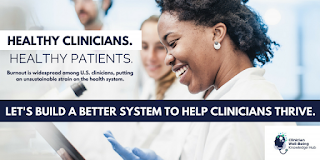 If you work in primary care, I highly recommend connecting to an ECHO®. If you work at a larger health center and could be a "hub", I highly recommend you connect to an ECHO®. The program benefits the hub and the spokes. FAQ sheet for Healthcare Admin about ECHO® from benefits to challenges. 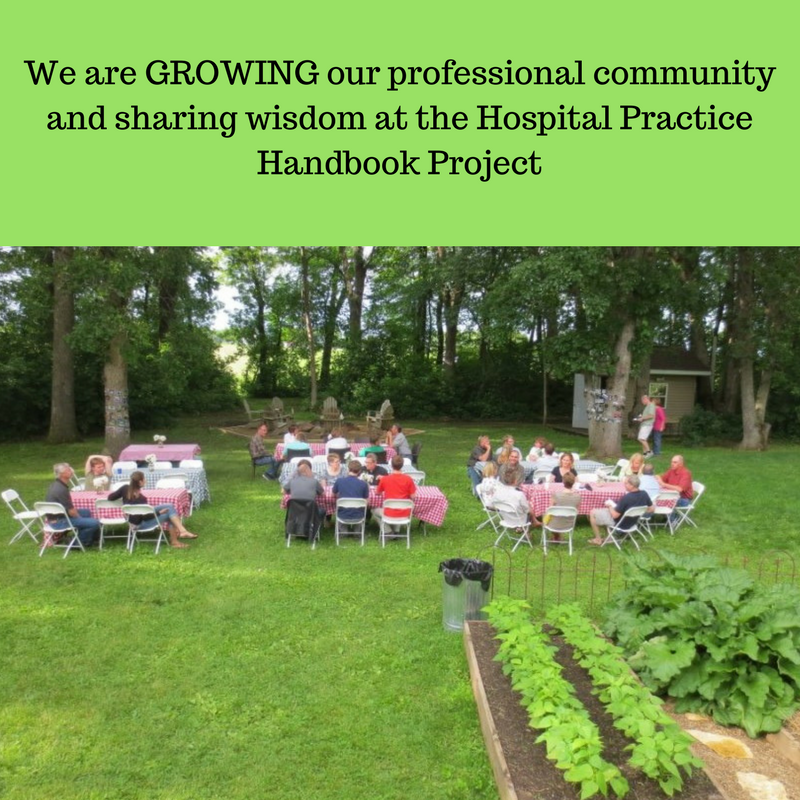 Interested in the Hospital-practice Handbook Project? 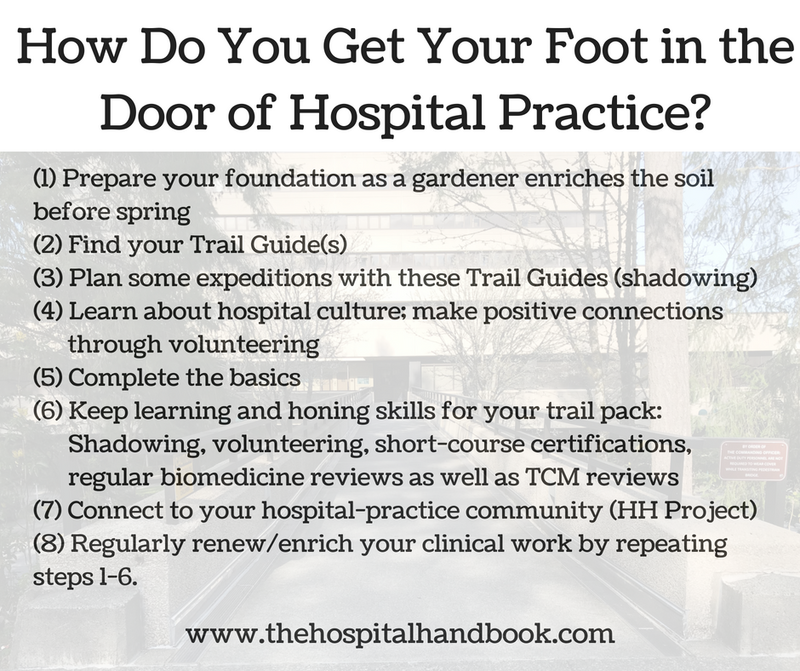 Order the "How to Get Your Foot in the Door of Hospital Practice" comprehensive pdf with resource section. Take the short course on How to Use a Validated Pain Scale in Your Chart Note, to support the Hospital Practice Handbook Project while gaining a valuable clinical outcomes metric tool for your practice. As acupuncturists, we are all well aware of its effects on analgesia. The benefits of acupuncture utilizing endogenous opioids activated via descending pain pathway have been well documented. The article, though, is focused on something entirely different. It outlines the benefits of needle technique in manual manipulation versus electro-acupuncture (EA). In "Cellular Reorganization Play a Vital Role in Acupuncture Analgesia", Liddle and Harris review recent development of fascia, mechanotransduction, extracellular matrix rearrangements, and inflammation response in the body in relationship to acupuncture. They suggest long term benefits of acupuncture analgesia may be attributed to cellular reorganization by lowering the "mechanical stress state of the tissue's mechanical receptors". The paper largely cites Langevin and her research in fascia. If you have been living under a rock and not heard of Helene Langevin (or, like me, already have a fan girl brain crush on her) read the article now. As one would expect from Harris, the article demonstrates profundity in fascia and interweaves the great mass of research spanning over 40 years into a single paper (pun intended). Interestingly, the paper differentiates needle technique. It radically details the importance of achieving de qi in treatment. This is a fairly simple concept to an acupuncturist. The paper's strength lies in what is not spoken. I believe it can be used to demonstrate the importance of seeking an acupuncturist versus a provider who dry needles and would not know "setting fire on the mountain" to an "eye of the tiger". The paper clearly uses TCM terminology. I also believe this paper can be used to strengthen distal acupuncture styles like Balance Method or Japanese style compared to a more direct local musculoskeletal style. So, it goes without saying, further studies are needed. Hi, my name is Liz Dart BS, MSAOM, EAMP, LMP. After 15 years in the healing arts, I am currently in the final stretches of earning my DAOM at Bastyr University while participating in clinical rounds at Harborview Medical Center. 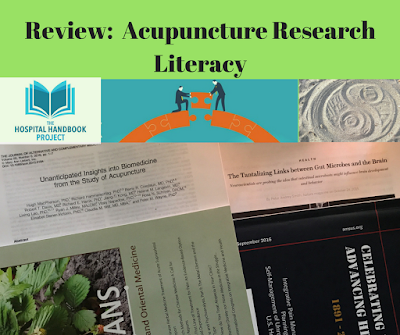 September 2017, Acutalks interviews Helene Langevin, PhD on her Acupuncture Research, 9.5 minutes. Published by Osher Center for Integrative Medicine. May 2016. "Stretching, Connective Tissue, Chronic Pain and Cancer" talk by Helene Langevin. Helene begins the talk at about minute 9. length of presentation is 58 minutes. November 2015, Helene Langevin, PhD's talk on Acupuncture, Oncology and Fascia at Joint Conference (SAR, SIO, FRS). 35 minutes. September 2016, Robert Schliep, PhD and "Fascia as Internal Sensor". 34 minutes. Research Review: NSAIDs reduce the effectiveness of electro-acupuncture on decreasing pain and inflammation. The resource section includes a biomedical review of the inflammation pathway and a review of the pharmacology of NSAIDs. support operating costs for a day. How full is your wellness bucket? Are you making time for regular self-care and wellness activities that build your resilience? 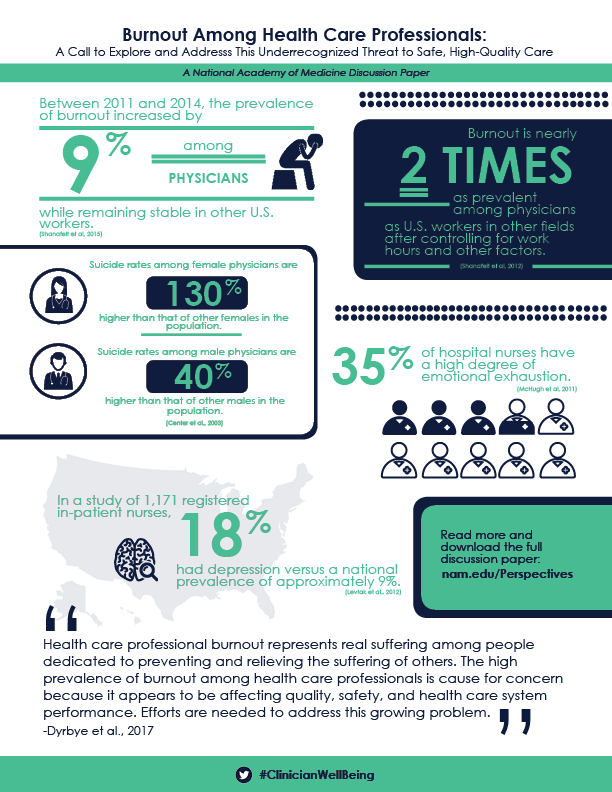 For health care providers, especially those in hospital-based practice, burn-out rate is very high. The National Academy of Medicine is running a series of open meetings on "Clinician Well-Being". These 2018 meeting sessions were webcasted and recorded. You can view the recordings on YouTube and read the related discussion papers on their website. 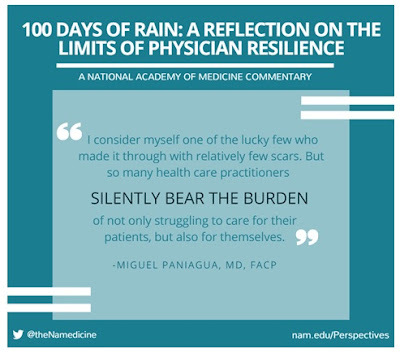 Remember, in integrative health, a core tenet of the practice, whichever your specific discipline, follows this basic idea, "Physician, heal thyself". The May meeting webcast recordings. 3. Elevate evidence-based, multidisciplinary solutions that will improve patient care by caring for the caregiver"
The Gold Foundation, "Humanism in Healthcare Supports the Quadruple Aim"
Find more fodder for your Lunchbreak Learning on the Hospital Handbook Project's "Lunchtime Listen Recommendations" page.